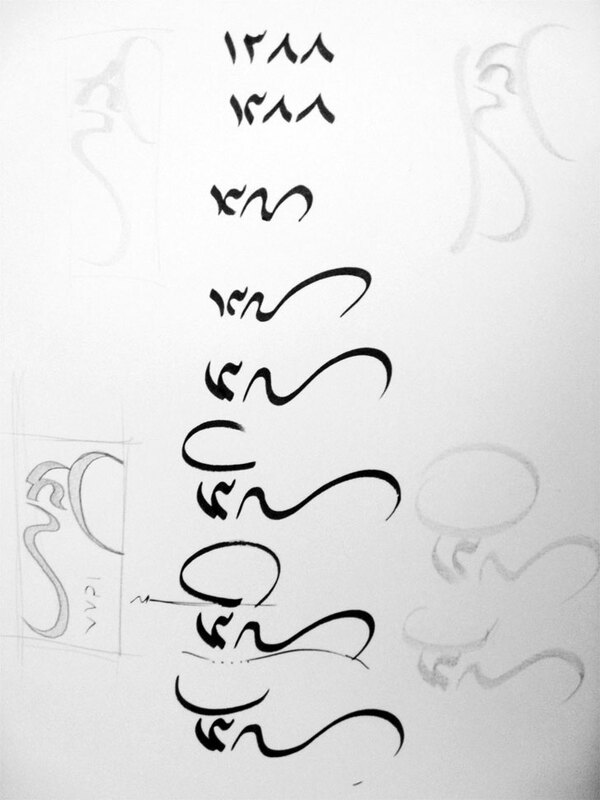 Above: Omid Hamooni, logotype for an exhibition titled, Solar Year of the Cow, 1388/2009. Omid employs essential elements of the numbers one, three, and eight (1388). 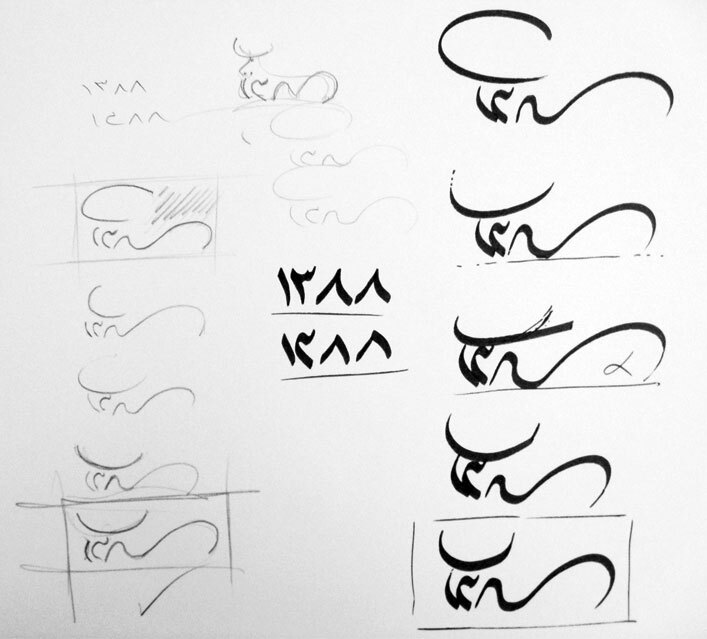 Below are two process pages that help explain his thinking in developing both the form and movement required to achieve this subtly zoomorphic form. Above: Omid Hamooni, process. Click images for a larger view. Above: Omid Hamooni, process. Below, a lovely piece of music from Iran. hand and eye at work. Omid Hamooni / Flags and feathers. man az haminja elam mikonam ke in comment bad az tahdidate jenabe hamooni gozashte shode va man aslan alaghaie be anjam in amr nadashte va nadaram. dar morede in logotype ishonam bayad begam ke tarho midozdi az man chera dige to net mizari…!!!! on balaie ke shokhi bood vali khaiiiiiiiiyli khobe, kare mohkami shode va khoob neshon mide ke tarrahesh be osole tarahi vaghef boode. be doosti bahat eftekhar mikonam omid. 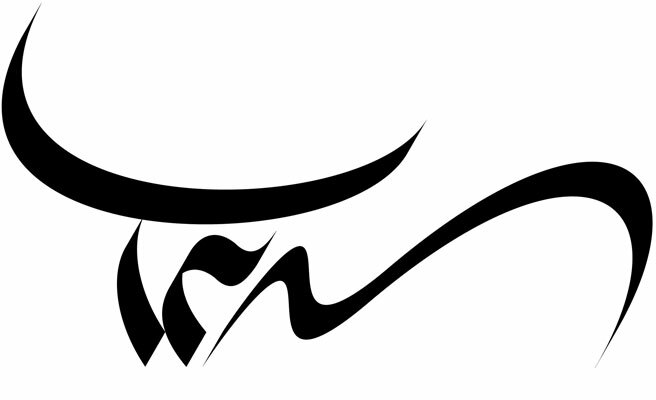 he is good on Iranian Calligraphy because you see ability on this logotype. he composition Iranian Caligraphy and Modern form very good and making of numbers amazing concept from Cow that show the Solar Year of the Cow, 1388/2009 by best form. Welcome and thanks to all the above for their comments! Geotypografika welcomes your insight and contributions. the sketch itself is such a flawless form. wonderful! so good to see process / logotype ! So thanks from all frinds for kindness words about my work,I hope for you hearing best. And special Thanks form Erik Brandt for all things. This entry was posted by Erik Brandt on Saturday, March 14th, 2009 at 9:21 AM	and is filed under Aktuell, Art, Education, Geotypografika, Globalization, Graphic Design, International, Poetry, Typografika, Typography.